I don’t really need to plead the case for the weekender bag, but I will anyway. 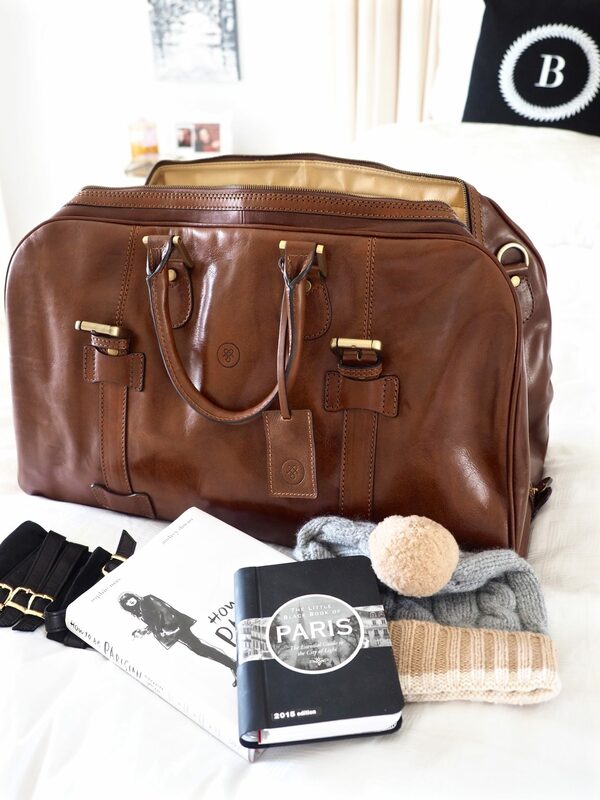 In my opinion, weekender bags are the ideal size for a getaway of up to 5 days. They force you to pack only what you need and no more, and allow you to travel with only carry-on luggage if heading overseas, or to grab a bag by the handles for a road trip getaway, instead of slugging your suitcase up a flight of stairs or along a pebbled drive way (we’ve all been there). Don’t overpack: the weekender bag is about forcing yourself to find the balance between what you do and don’t need for your weekender bag. It is not too small but not too big, so remember what goes in must come out! Don’t forget a good book: a weekend getaway essential. Whether you fold, roll, or throw it all in… its all going in one way or the other (don’t be afraid to pack in under 5 seconds and call it a talent). Use a smaller compartment for important bits and pieces to ensure safekeeping. Place your change of clothes in the bag first, followed by your gadgets and bits and pieces you will need first. Take a separate bag for snacks and drinks to place inside the car or mode of transport. Then place your weekender in the boot and hit the road. Place cosmetics in a smaller bag to separate from garments in case of spillage and for easier access. The winner of a Maxwell Scott washbag (worth £99.00) is Emily with her acrostic poem! Check the comments to see it! You’ve won! Pretty please email management@worldofwanderlust.com with your full name, postal address and contact phone number. Harry Styles, an open fire place in the British countryside, plenty of red wine, a furry little puppy to keep us entertained and snow. It is the simple pleasure in life, right?! A drive to the gorgeous town of Rutherglen to be exact! W orkwear included is a definite no no! C offee and cake at the Black Coffee Cafe. My ideal weekend getaway would be anywhere with markets. I never get tired of the lovely colours of hundreds of flowers, the smell of fresh food and the glow people have when they see that one thing they have been looking for. A perfect weekend getaway would be any place that has plenty of love to go around and music running through its veins. Moving a couple years ago from the Bahamas, our now dream getaways include jet setting across Europe. On the top of our weekend getaway list is Prague we have been plotting since our move and hope to make it there next spring. My idea weekend getaway would be somewhere in the middle of nowhere in the Scottish Highlands. Maybe a tiny cottage or log cabin. It would just be nice to switch off from the world for a few days with copious amounts of tea and biscuits and a good book or two. Ideal getaway – glamping! Glamour camping. Doesn’t get much better than that! A weekend getaway is the recipe for happiness when we get caught up in the hustle and bustle of our daily lives – especially work. Nothing makes me happier than spending time with my family and friends. Wine is a must — priority baggage! Eating lots and lots of food — food coma will happen. Namaste – relaxation of course is in the mix. And did I mention dancing? Baila, baila! Weather needed is sunshine – my only sunshine! Yes, and by the end, my heart is beaming with happiness!! I always thought having the perfect weekend would be traveling to somewhere adventurous with breath taking views and scenery.Perhaps New Zealand with stunning nature views. I was away in Iceland this past weekend and it was such a eye opener for me. With beautiful snowy mountains, puffy sheeps thats on the side of the road, my whole trip was absolutely awwed. My ideal weekend gateway would be with my husband where we travel aimlessly to somewhere spontaneous. We can then explore and adventure around to discover local eateries and breathtaking views. Who can go past Broome for a weekender? The thought of sipping a Matso’s mango beer and watching the sun go down after a long, lazy day is tantalising! My ideal weekend adventure would be a car, a camera, no map and the road. I would just follow the road for a while and I would stop wherever looks interesting. The answers aren’t always in the travel guides, though I love them, but finding the unknown can always lead to a great adventure. My ideal weekend get away for me, living in Auckland New Zealand would be Queenstown! I’ve never been there but am actually going there after the New Year for a few days with my family! It’s the adventure capital and I’ve heard is the most beautiful place to fly into as you fly through snowy mountains. I want to go and hike through the mountains, take a lake cruise and bungy jump! However next year when I am living near the Swiss alps in Morzine, France! My dream getaway will be to go to Lucerne, Switzerland! It looks so beautiful and quaint. My ideal weekend trip would be down to Mexico, about 4 hours south of my home in Arizona! My ideal weekend getaway would be Mexico. I’m from an island, but love to explore the sand & surf of other places! Thanks for the packing tips – very timely for me. My ideal weekend is one where I can enjoy drinking my coffee and just stare at the scenery. Although I was only able to experience it twice, I still would like to just grab my bag early in the morning and head towards Tagaytay and watch Taal Volcano and the surrounding lake. It is such a peaceful site that I feel energized to start another week of activities in the corporate jungle. As a college student in Austin, Texas – quite far from my home – I am constantly grabbing my ugly little carry on to hop on a plane home or to a friend’s college for a visit. I really really wish I could travel in style and this is one of the cutest bags I have seen. I love your style and travel advice. If I won this bag, it would make my travel much more comfortable. It is amazing how much better it makes you feel to travel in style! A bag like this one would be absolutely perfect for my weekend trips home to see my parents. It would allow me to carry all of the clothes I need from school that I won’t have at home, as well as some of my reading material for my classes! My perfect weekend getaway would be a trip to New Orleans. I’ve never been there, and it’s “only a few states away.” lol I just want to meander through the French Quarter during the day, and visit the jazz clubs at night. At the moment…the most perfect weekend getaway would be to one of the many gorgeous country manors in the UK in a room with a fire going and lovely deep bath in the bathroom…and room service for the duration….oh and perhaps a leisurely stroll of the grounds. Yip perfect!! It is so difficult to choose just one place that would make my weekend ideal. However, living in Europe, I would choose Bruges as my getaway of relaxation and beauty. I would especially choose it during autumn or winter, so that I could enjoy all the little coffee shops and cozy nooks that the city has to offer. Just waking up in Bruges and walking around the central market would make my weekend the best source of energy and warmth to start my week on the right foot. My ideal weekend trip would be some wellness & spa resort in Austrian or Swiss Alps. An ideal weekend for me would be to Whitsunday Islands to relax and have fun. I love water activities like snorkeling, kayaking and paddle boarding, and enjoy trips that are packed with different activities to do. What a better way to enjoy nature at its best than in the Great Barrier Reef! The perfect weekend getaway would be to the Kruger National Park in South Africa. That place is a little piece of heaven on earth. The beautiful weather, the stunning scenery and of course, the hundreds of various plants, birds and animal species to look at! I love nature and I love animals. Waking up to a beautiful African sunrise and going on a Safari around the Park to look at the Big 5 and other animals would be a perfect weekend away and a break from the never-ending city life. So in love with the bag. An ideal weekend trip is starting from London, and heading to the neighbouring countries per train. Awesome visit from London to Lille to Paris to Brussells, then back home to London. That bag is the best to-go-bag to have everything in it. My favorite weekend getaway is a romantic bed and breakfast overlooking the water somewhere-but especially on Mackinac Island, Michigan. Man, I would love to go to Hawaii one day! An ideal weekend for me (if money wasn’t an option!) would be visiting the beautiful country of Ecuador with my sister! I would love to visit the Galapagos Islands to see the stunning marine life and costal area. There I could go snorkeling, see cute little seals, catch up on the sun, and enjoy the friendly people there. Then I would leave the coast and go into the mountainous interior of Ecuador to hike in the clouds, swing on the edge of the world near an active volcano, and see all the gorgeous hummingbirds in Baños. My ideal weekend trip would be a hop across the pond to London! Okay, maybe a long weekend. A day to wander the regular sites, dinner at a gastropub, a drive out to the Cotswolds or maybe a trip to Lincoln because a friend loves it so. And of course, time for the Tate! Some think a long weekend across the Atlantic is too compressed; I say it’s the perfect getaway. I would love to go on a weekend adventure to the Kimberly. I keep seeing all the wonderful adventures off the beaten path and want to go explore. We’ve been having snowstorms at least twice a week since a month ago here in Bozeman, Montana. My perfect weekend getaway is to drive up to the national forests (preferably, flathead national forest nearby glacier national park) for a snowshoeing trip. 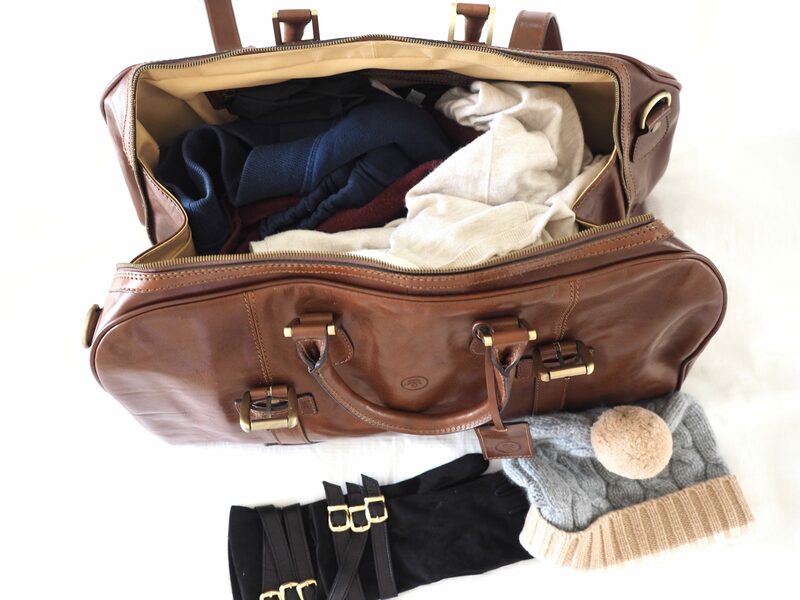 The weekend getaway bag would be great to fit my scarves, gloves and winter wear for the weekend. As an international student in the US, I’m so psyched to be spending thanksgiving sledding and skiing! My perfect weekend getaway would ether be to the town of Sorrento in southern Italy because the water is crystal clear blue and the food is amazing! Or staying in a Chalet in Whistler ski resort just outside of Vancouver Canada, because its the most amazing place to ski, with a great village for after, and I’ve been going there since I was a kid and have great memories. My ideal weekend getaway would be a trip to Big Bend National Park in Texas. It’s close enough that I could go in a weekend, and I’d love to get to see the Rio Grande and Mexico, and get to hike around the park and explore more nature here in my new home state. My ideal weekend trip is would be to go to St. Lucia. I got the chance to visit when I flying to Trinidad and I had a layover there for half the day. I’d love the chance to explore the island a bit more with a group of friends and visit the hot springs, do a rainforest hike, and enjoy the beach. Thanks! Being a study abroad student in Milan, Italy for about four months, I’ve realized how important your luggage can be for weekend trips. I just came back from camel riding in the Sahara Desert in Zagora, Morocco this afternoon! My ideal weekend getaway would be one with nothing back home interfering and one with everything there worth trying. I want to erase the responsibilities that always sit at the back of my head and truly enrich myself with the culture of wherever I place myself for this ideal weekend. My ideal weekend getaway would be to my go on one of the 48 hour cruises to Kiel from Oslo, or simply to run away to my sister’s mountain cabin for a couple of days 🙂 A little duty free shopping or cozying up in front of the fire = perfection! My perfect weekend trip would be a weekend away to Edinburgh! I’m dying to discover this lovely Scottish city. My ideal getaway weekend is the one my boyfriend was “secretly” planning for us in January…. I finally got it out of him yesterday and he is flying me to Orlando FL to (finally) see the Wizarding World of Harry Potter!!!! Words cannot express how excited I am about being there!!!!!! I am counting the days! My ideal getaway weekend would be a surprise one in February to Turks and Caicos when we’re up to our ears in snow here in Canada. A few days in the warm water makes this mermaid happy. “Let’s get out of the cold” Is how my sweetie surprised me a few years ago in April when it was a long winter and we hopped in the car the next day and drove down the east coast deep into Florida. We stayed in small towns, found some great coffee cafes, and chatted with locals who recommended places to eat. He’s pretty good at surprises. For our third date, he called me at work and told me he wanted to take me to Sandals in Jamaica. On that trip he asked me to be his Valentine. I’ve been his permanent Valentine for 23 years this week. My ideal weekend getaway is a quite trip to New York City to see a show and eat at a great restaurant. A cheeky, fun trip away to Disneyland Paris – cause you’re never too old 🙂 with my boyfriend, because we spend every Sunday afternoon watching Disney films together! My ideal weekend getaway be with my sister to Bordeaux. We just love France so much!! My ideal weekend getaway would be to go to the airport and pick the first flight out. I live in Rome, so I could only imagine that there would be a wonderful destination awaiting me and a life-changing adventure about to be taken. Come along with? Hi there, my perfect and ideal weekend getaway would be one of the Nordseeinseln in Germany with my dog. Perfect beaches, nice stormy weather and a hot chocolate in one of the Café´s on these incredible Islands like Langeoog, Borkum or Juist. I just love it, and it doesn´t have to be summer for that. My ideal weekend trip would be with my two girlfriends to small Greek village enjoying the beautiful weather ,the tasty local food and the amazing scenery!!! My ideal weekend tip would be to stay with my aunt and uncle just 3 hours south of where I live, Manjimup. They and I are always busy, but they live on a secluded little farm with chickens, sheep and horses. It’s just so peaceful, calm and simple. I don’t need a beach-y getaway. I just need family and a break from city life. My ideal weekend getaway would be a few days in the south of France. I love France for its food, culture and beautiful language. It is also a stunning country. Living in the UK, it is so easy to shoot on down to France for the weekend and I really love that! My ideal weekend getaway would definitely be Nice, France. Other than it being absolutely breathtaking with the view of the cobalt blue sea, the grey sun kissed pebble beach and the differently colored buildings, it is also the best place to sit back, relax and read your favorite novel. The winter hits Nice pretty late, and this makes it all the more enjoyable. And if looking for a night out, Monte Carlo is just a few hours away! My ideal weekend getaway would be taking a trip to “Hatta” in the Middle East, which is known for its history, heritage and nature! 1. The Hatta Pool where it is basically nestled in a rock crevice, the natural spring water comes from the mountains and makes for an extremely refreshing dip. 2. Also, swing past Hatta’s Heritage Village which is a 16th-century village with 30 or so buildings to explore. My ideal weekend getaway would be to take a road trip to Hyam’s Beach at Jervis Bay (in Australia)! I’ve been there once but it is one of the most stunning and picturesque beaches in Australia (and I live here so I’ve been to a lot!) The colourful birds, crystal turquoise water, pure white sand and endless sunny days is what draws me to this relaxing weekend getaway location. I can already imagine reading a book with a glass of homemade lemonade! My an ideal weekend getaway would be trip to the East of Russia. One of the best things that you can do there is to book a hotel with a swimming pool outside! It would be so great to swim in a hot water while it is above 30 degrees of celsius and observe the most beautiful snow-capped mountains of snow. Moreover, you can try traditional food of the Kamchatka region. Mainly, it includes different types of meat or fish, delicious soups and warm coctails made of berries from the nearest forest!! Not to mention, the Valley of the Geysers should be on your bucket list as well as the Volcano called Tatya! I would love to visit this region during the winter season because it displays the spirit of Russian culture just in one place! Believe me, it will be the most extraordinary and unforgettabe trip you ever had, and memories which you will cherish forever!!! Madrid! Museums during the day, and the opera and tapas at night <3 I'll be in Spain in Jan/Feb for summer school (in their winter) and cannot wait to do this! My ideal weekend getaway is to visit Tuscany! I love pizza and I would start the weekend taking a cooking class on saturday and learn how to make delicious homemade wood fire oven pizza topped with mozzarella cheese, prosciutto, pepperoni, tomatoes and drizzled with olive oil. Then, on sunday, I would wear my favorite dress, stroll through the local markets and then enjoy a box of buttery, flaky, pastries and chocolates and end the trip with some relaxing time by the ocean with a good book! It would be the most fun time and my dream food getaway!! My ideal weekend getaway would have to be in Rio. The city of breathtaking views and the perfect combination of urban and beach landscapes. It would be fabulous to take a cable car to Sugarloaf mountain to watch a sky level view of the sunset. Rio would also be the one city I would love to take a helicopter tour of as well to fly high above the gorgeous scenery that this city has to offer. On the ground, I would join in the festivities of the famous Carnival of bright colors and bold dance moves. There is just so many things to do even in just a short getaway! On my bucket list is Budapest, Hungary. It’s too beautiful, and I’m dying to visit the National Gallery – all that architecture! And maybe take a boat trip down the Danube… A girl can dream lol. My ideal weekend getaway is one I am planning RIGHT NOW to the jungle of Bolivia in Rurrenabaque. There is camping in cabins, walks through the Amazon, piranha fishing and swimming with PINK dolphin! perfect, adventurous, and relaxing. What I really need right now is a getaway to Switzerland – my dream retirement country – with the lush greenery and the mountains poking out from the background. I would love to just have some quiet time spent with loved ones in beautiful nature. I would love to revisit Africa, specifically Tanzania. Split the trip between safari tours and beach days, all after hiking up Mt. Kilimanjaro. A little mix of adventure, activity, and relaxation all in one incredible country! Such a beautiful bag! Lately, I’ve been traveling long-term and living out of a backpack abroad, but once I’m back home in the States, I have a huge wishlist of long weekends to take — and I’ll definitely be investing in a nice weekender bag then! At the top of my list? A getaway to Austin, Texas, for a long weekend of amazing Southern and Mexican food, eclectic shopping, countryside drives to swimming grottos like Hamilton’s Pool and — the biggest draw of all when in Austin! — all things music! and my parents, who just deserve a break. I’m twenty-two and I’m okay with whatever they’d want to do as long as there’s good food and warm weather. We’ve always gone to Disney World in Florida, which is the closest to appealing to everyone, or maybe a cruise then? Planning a family trip or vacation always requires a bit of brainstorming and research lol. The first place that comes to mind for me is Scotland but I am sure I would want to spend more then 5 days there lol. As of right now, my ideal weekend getaway would be Iceland! It would be incredible to be in the middle of such a unique natural wonderland! My ideal weekend getaway is to Martha’s Vineyard with my husband and 3 daughters! Or maybe just my husband!! We love the fish tacos at Net Result and a perfect sunset at the end of a day spent on the beach! I am planning right now a weekend in Kopenhagen with some other friends from my year overseas. A friend I met in my year overseas in the US is living in denmark and we are trying to stay connected from Germany, so we are meeting up in Kopenhagen and planning a new jorney and sample some new memories. My perfect weekend getaway would be to Paris. I’ve only visit once before (this summer), but I immediately fell in love with the city. I love the architecture, the savoir-vivre, the museums, the shopping, the food and just sitting in cafés watching people go by and enjoying your coffee or tea. I’m also really in love with Parisian fashion and of course macarons! My ideal weekend getaway would be to go to Tasmania (I live in Sydney so it’s fairly close) and to spend the weekend exploring the island, if the weather was warm I’d hit up the beaches and if it was cooler, which it is mostly, I’d bundle up in my Autumn clothes and visit wineries and orchids. I’d spend a day driving thorough the country side finding every coffee shop along the way. I love the city but getting away from it all for a weekend would be perfect for me. My ideal perfect weekend getaway? I’m flown to a non disclosed place with my new husband. He takes me on a boat to a small island that has a house right on the beach. We spend the weekend getting to know each other better, breaking headboards, playing chess, and swimming in the ocean. That could have been straight out of a movie (teehee) but wouldn’t that be an amazing weekend getaway? My perfect weekend break would be a last minute flight, somewhere unexpected that I’ve not been before. Maybe Riga, Ljubljana or Dubrovnik to walk, walk and walk some more exploring until my feet fall off! My perfect weekend getaway is to go to the mountains with my husband. I’m planning a trip from NYC to Montreal in the upcoming months and this bag is the perfect size for my long weekend trip! it seems great to carry my stuff up but flexible enough to continue using when I’m there. I’ll need to for my phone and charger (google translate! ), hard copy maps, my dslr camera and book for any long transit rides or decompressing. Exploring the city solo in a place that doesn’t speak English will be a challenge but I’m excited for it! My ideal extended weekend getaway would be a road trip out to Portland, Oregon. I would love to stop and visit as many National Parks as possible on the way so I could experience the breathtaking views and go on amazing hikes. I would pack my small hammock so I could find a relaxing spot to stop and read my book and my camera to capture some of my experiences to look back on. Relaxing at the Exuma Islands for a 3 day weekend would be my perfect getaway! I would so nothing but chill in the sapphire blue waters, read one of my favorite books The 48 Laws of Power for the 4th time and take one day to go sailing. Ahhhh thinking about it makes me feel relaxed right now. 🙂 2016 goals. My idea long weekend getaway would be somewhere like port Douglas, equal parts exploring and relaxing – a day hiking through the forest and coming back for a massage and facial. I live in Holland. So I like to visit a city in Europe. I have been to a few, but I would like to visit many more!! I also like to go to the beach, especially at fall with my dog. Just to take a break, clear my head and forget reality. I like the bag too much, it’s perfect (I always overpack..) and that colour tho!! My ideal would be Reykjavik along with the rest of Iceland. Its a short flight from my closest airport and I imagine that Iceland’s nature is tremendously restorative, just look at that beach that has black sand. Also I would like to see what Reykjavik has to offer, as I really love visiting capitals. My ideal weekend getway would be to SA for A weekend of bike riding and wine tasting. My ideal Getaway is to my family’s ‘Bach’ in New Zealand. It’s just a tiny little house on the north island in the most beautiful location, and it’s just a 3 hour flight from my home in Brisbane, Australia. Plus, during winter, it becomes a skiing getaway! My ideal weekend getaway is spontaneous. I don’t want to know my destination until a few days ahead. My getaway bag could be packed with a few swimsuits, sunglasses, and sunscreen, or it could be filled with my trainers and workout clothes. I would want to escape and discover new adventures. I would want to explore coral reefs, hike new trails, and eat food that’s unforgettable. My getaway will want me wanting more. My ideal weekend getaway, would be to throw my swimsuit, sarong and book into the bag and head to a beach. Nothing beats relaxing on the beach with a good book and someone to bring you umbrella drinks all weekend and hopefully leaving you refreshed for the week ahead! My ideal weekend getaway is to Southern California or the Mountains of Utah! My ideal weekend getaway is NYC, and that happens to be on Friday! NYC never let’s you down for constant adventure, there is always something new to check out. I love getting lost in Central Park, exploring SOHO, tasting my way through the city and skating on the ice rink at Rockefeller centre (if winter). 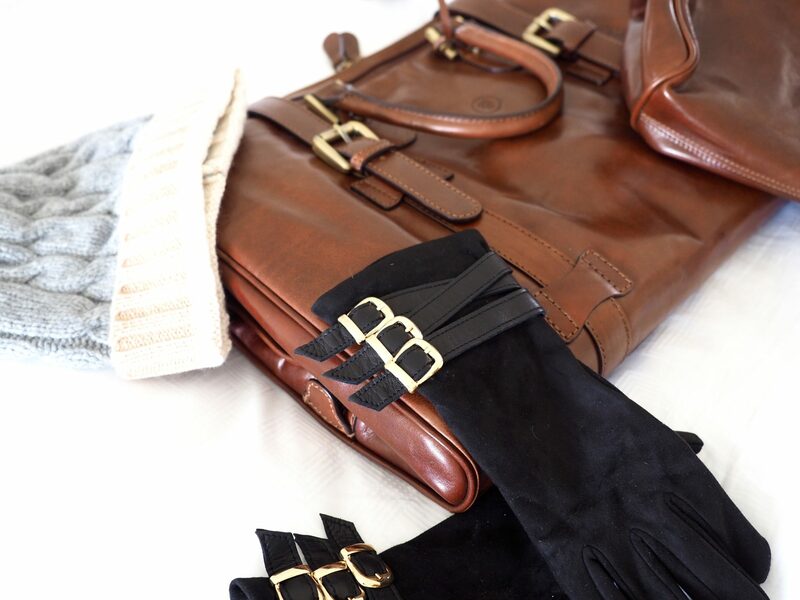 A weekend bag is ideal for 4 days in NYC, just make sure not to forget a pair of heels for a night on the town! This weekend getaway includes exploring Brooklyn and a stop at the Sprinkles ATM, something I’ve never done before! Being from California my ideal weekend would have me take a long but not too long road trip up the coast to Big Sur. It’s one of my favorite places and the last time I was there was many years ago, I am in desperate need of a trip back. I imagine myself singing along to music and eating junk food as I make my way. Something I have always wanted to do but never got the chance for an ideal getaway weekend is go to the airport with just a carry-on, my passport, money, credit card and an adventurous spirit, ask the person on the counter which plane is about to take off, buy the ticket and engage on a one-of-a-kind trip. My ideal weekend trip would be a restorative wellness trip to somewhere like Mii Amo, Cal-a-Vie or Rancho La Puerta!